Tuesday 29 April 2008 at 10:24 am There seems to be plenty of surprising stuff over at the BBC website. One of the strangeties is this reaction test game on which you're given the job of a shepherd. Armed with tranquilizer darts, you're trying to stop your flock of turbo charged sheep from escaping. One by one they try to make the run, and one by one you stop them with your darts. After five attempts you're given your reaction times and an overall grade of your performance. Fun, and oddly addictive! Virus 2 is a simple, yet challenging puzzle game. The aim is to make the virus spread from the bottom-left corner to cover the whole area. This is done by changing the colour of the virus, allowing it to spread further. A nice little brain-teaser that gets harder and harder, as the number of turns allowed is lowered each time you manage to spread the virus all over the field. Card Toss is a fun little game of throwing playing cards into a hat without having to find a real hat to toss cards into. No need to tediously pick up cards scattered on floors anymore! Nice hand-drawn graphics, smooth animation, and simple gameplay. More waste of time to come (someday)! 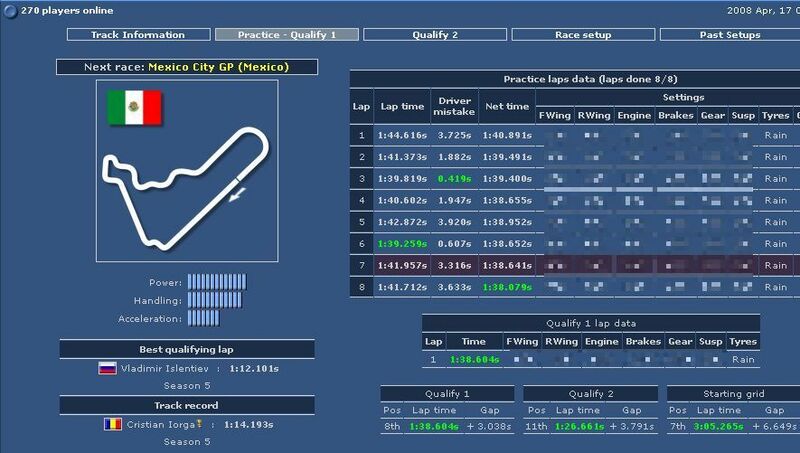 Thursday 17 April 2008 at 10:13 am Grand Prix Racing Online is an online multiplayer Formula 1 management game, in which you take the role of the mastermind designing the strategy of your racing team. The tasks are numerous: hire and train drivers, develop the car, choose the correct settings for the track in question, plan the race strategy, and so on. Essentially the game is not very complex, and learning the basic options is a breeze. The difficult part is finding out what the correct car setup might be; how to optimize the downforxe with front and back wings, what is the correct bias between engine power and acceleration, how much gasoline should the car have in the qualification stints and in the race, how many pit stop visits should there be in the race, what's the most excellent choice of tyres for the current weather, etc. Success comes with practice, experiment, trial and error. However, even the best planned tactics can fail simply because of a driver mistake, a crash, a sudden change in weather, technical errors, you name it. The races take place on Tuesday and Friday evenings, and they can be followed live with real-time lap by lap updates, during which it is also possible to chat with other managers. The game has players from all over the world, but it seems to be most popular in the Baltic countries, Poland, Finland, and the UK. The community around the game is vibrant and friendly, which makes it very easy to get started. Nice!